Hi there! Today, I would like to give some information and links about the tools used generally for sequence assembly, soon I am going to post a new article about the current state-of-the-art in visualization focusing on NGS. AMOS is collection of tools and class interfaces for the assembly of DNA sequencing reads. Bowtie is an ultrafast, memory-efficient short read aligner. 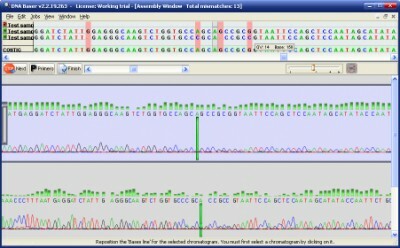 Cap3 is a DNA sequence assembly program. Consed is a tool for viewing, editing, sequence assemblies created with phrap. EagleView is an information-rich genome assembler viewer with data integration capability. Gap5 is a general purpose multiple alignment program for DNA or proteins. GigaBayes is a short-read SNP and short-INDEL discovery program. Maq is a software that builds mapping assemblies from short reads generated by the next-generation sequencing machines. Maqview is graphical read alignment viewer. MOSAIK is a suite comprising of three modular programs: MosaikBuild, MosaikAligner, and MosaikAssembler. Phrap is a program for assembling shotgun DNA sequence data. Phred software reads DNA sequencing trace files, calls bases, and assigns a quality value to each called base. PolyPhred is a program that compares fluorescence-based sequences across traces obtained from different individuals to identify heterozygous sites for single nucleotide substitutions. VAAL is a polymorphism discovery algorithm for short reads. Velvet is a sequence assembler for very short reads.